What is the Appellate Moot Court Board? The Appellate Moot Court Board provides upper-level law students with the opportunity to develop their legal writing and oral advocacy skills at competitions across the nation. The Moot Court Board has created a collaborative environment for students to work together in writing briefs and preparing oral arguments on real-life legal issues. Not only do our members develop essential legal skills through competing, but they also have the opportunity to network with practicing attorneys and judges at these competitions. 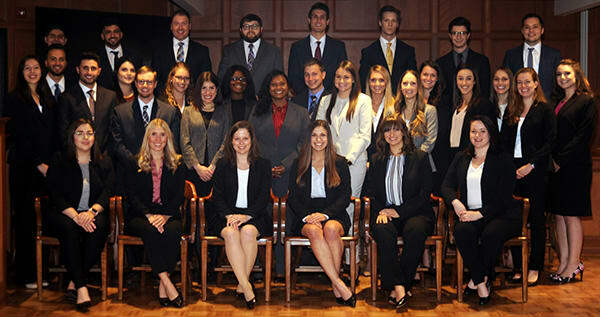 Duquesne’s Appellate Moot Court Board has a strong legacy of success. Just this past year we had four teams, all at different competitions, advance to the semifinals, with numerous students receiving individual rewards and recognition as well. To highlight just a few of our recent successes: last year, a team of second-year students advanced to the American Bar Association’s National Arbitration Competition and finished as semifinalists. Additionally, a team of three students were named Regional Champions of the National Appellate Advocacy Competition in Brooklyn, New York, and went on to compete at the national semi-finals in Washington, D.C. Lastly, two of our second-year students tied for Best Oralist at the Seigenthaler-Sutherland Cup National First Amendment Competition. Each year we hope to send all of our students to a competition. As you may know, competition entry fees, transportation costs, and hotel costs can all add up quickly. Large or small, your donation will directly support our members, ensuring that they can compete and represent Duquesne Law. With your help we can continue to build on this program’s tradition of excellence. Please consider donating today! Another way to support is to spread the word by sharing this page with family, friends, and even other past members of the Board. Also, stay connected with the Board by following us on Facebook. Also, keep up to date on our success by visiting our website. Contact Sam Nolan, President of the Appellate Moot Court Board, at nolans1@duq.edu.